I have mentioned previously that I had a nasogastric (NG) tube put in on my first day in hospital. 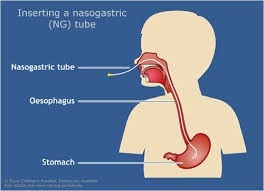 An NG tube is a thin, rubber tube inserted through the nostril, down the esophagus, and into the stomach. An NG tube was used to deliver food and medicine straight into my stomach. As a Dietitian I was regularly involved in advocating for tube feeds for patients unable to consume sufficient oral intake. It was always one of those foreign aspects of my job. I had no concept of what it was truly like. It was so surreal to now be the patient. Having the tube inserted was a bit uncomfortable but not nearly as bad as I had imagined. I was never really aware of the feed running through the tube into my stomach. It just dripped in slowly during the day so I never felt hungry. My medications were all crushed up, mixed with water and squirted down this same tube. NG tubes are notorious for getting blocked. So after I was given my medications, the tube was flushed clean by squirting a fair bit of water through it. I really looked forward to this. I could often feel the cool water on my throat as it travelled down the tube. It certainly wasn’t like drinking a glass of water but it was the closest thing I was going to get. A NG tube is only meant to be used on a short-term basis. Using a temporary NG tube for too long can lead to sinusitis, infections, and ulcerations on the tissue of your sinuses, throat, esophagus, or stomach. After a month of tube-feeding, it was obvious that I wouldn’t be devouring a scrumptious hospital meal anytime soon. The doctors started talking about a PEG (percutaneous endoscopic grastrostomy). 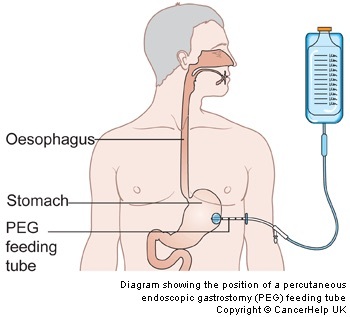 A PEG is a feeding tube which goes straight through your abdominal wall into the stomach. It is inserted in a minor surgical procedure. As a dietitian, the majority of my PEG feeds were on the kids ward, and they were almost always kids with serious, permanent disabilities. As soon as a PEG was recommended, I dug my heels in. Agreeing to a PEG felt like admitting that I was in my new, permanent state. I was not ready for that. For several days I argued. Steve was yet again the voice of reason for me. He pointed out that it would be more comfortable than having an NG tube irritating my nose. He also made me realise it would make my face look more normal for the kids. And he also reinforced that it was not permanent, and could be easily removed at a later date. It was the second hardest decision I’d had to make. (I think the whole ‘To live or not to live’ will always be on top of the list!) in retrospect it was not a big deal at all, but at the time it was emotionally devastating. 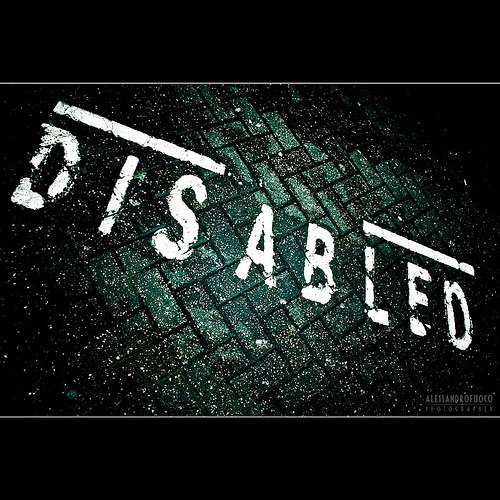 I felt the doctors were giving up on me and preparing me for my new life. Of course this couldn’t be further from the truth; but I was convinced. The surgery was scheduled, I was fasted and set to go. It is normally done under sedation. Here is another example of how completely spoilt I was by ICU staff. A beautiful Nigerian doctor was due to put me to sleep with Propofol and brush my teeth. He offered to bring all the equipment and come down to the lab with me, so that I could be asleep while the PEG surgery was performed. He knocked me out and both my teeth and PEG were done as I slumbered peacefully. It was inconvenient and time consuming for this doctor, but he offered to do to it this way to make me more comfortable. This doctor had been involved in my care from the beginning. As I mentioned he was from Nigeria and was black. Many people know that I have always found black men extremely attractive. One night Steve was joking around with him, and told him I thought he was hot. At that stage I could smile, but I had no control over my smile. Every time he came near me after that, I was so embarrassed, I smiled like a Cheshire Cat. I was so mortified to always have this stupid grin on my face, but he found it all quite amusing and took it in his stride. After a day, my PEG feeds were started. Once they had been established, my NG tube was removed. Steve was right, it was so nice to lose the tube on my face. One day when my Dad was visiting, the Dietitian came to see me. People who didn’t know me well were often a little self-conscious when talking to me. Do they talk to me or my family member? Do they need to speak slowly or loudly? Anyway I had put on a few kilos prior to my admission. I knew that any extra weight would make physio harder and honestly thought reducing my feeds would be a pretty easy weight loss regime. So I blinked out to Dad to ask her to set my feeds so that I lost some weight. She launched in to her pitch about maintaining muscle mass etc. At the end of her lecture, she asked what I used to do for work. I looked at Dad and started laughing hysterically. Poor Dad had to tell her that I too was a dietitian. The poor girl looked so embarrassed. So the PEG turned out to be a great thing and it didn’t mean my journey stopped there. At least the PEG feed was safer than an apple! Glad to see you writing again – makes me realise how far you’ve come. Am so proud of you, love you heaps. Ohh Steph you are amazing. I can just imagine you listening to the dietitian thinking……”Yep that’s what I would say or no I don’t quite agree with you on that”…….then having a good laugh when asked about your occupation. I am constantly amazed at how you kept your sense of humour.